Here are patches I wrote with Max/Msp for different uses. These programs are donationware (pyrolator@paypal.com). I would be happy if you send a contribution, if you like the applications and if you use it. 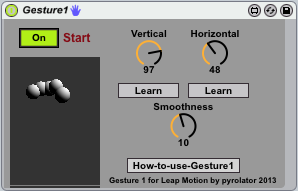 "Gesture1" is a quick and dirty Max4Live-patch to control any parameter within Ableton Live with gestures using the Leap-Motion-controller. The application audotomidi converts 2 monophonic audio-signals (microphone or line-signals) in MIDI, which can be send to any DAW. The program is optimized to use with Ableton Live on a MacBookPro. The Tenori-On is a great instrument. 1. A Midi-Clock, which is more exact. 2. A Layer, which can generate velocity and controller-messages to modulate a synthesizer. 3. 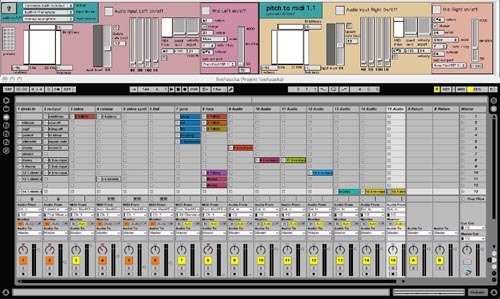 A Layer which controls the Ableton Live like a remote-control. This is the reason, why I made the "tenori-on helper". On my G5 it takes over 10 minutes to load, no fun……. written for using it with ableton live, but also might be well working with external synths. The Update also features a Limiter at the end of the chain, and visible gain-reduction for each band. You wish to add an AU/VST plugin behind iTunes, or as the last step (like ARC) before your soundcard or you internal speakers. "The last plugin" is made for that reason. Go to your Audio-Midi-Setup and use "Soundflower" (http://cycling74.com/soundflower-landing-page/) to route your Audio into "The Last Plugin".